Huell Burnley Howser (October 18, 1945 – January 7, 2013) was an American actor, comedian, and television personality who is best known for the travel television show California's Gold. Howser was born Huell Burnley Howser in Gallatin, Tennessee on October 18, 1945. He studied at University of Tennessee in Knoxville, Tennessee. He was raised in both Knoxville, Tennessee, and in Los Angeles, California. On January 7, 2013, at 1:11 AM,[source?] Howser died in Palm Springs, California of prostate cancer at the age of 67. ↑ Lindelof, Bill. "Huell Howser, maker of PBS shows about California, retiring". Sacramento Bee. 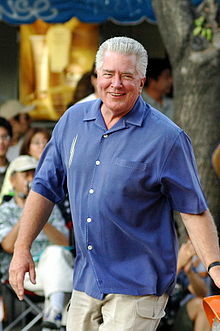 Wikimedia Commons has media related to Huell Howser. Lunch With Huell Q&A with Huell Howser by Aaron Proctor in the Pasadena Weekly August 20, 2008. This page was last changed on 8 January 2018, at 19:04.